Few images shout Middle East quite like the abaya - the long, black overgarment worn by millions of women across the Arab world. The design has remained pretty much unchanged for centuries, but a crop of young new designers in the United Arab Emirates are now giving the traditional dress a modern-day makeover. Nothing is off limits - designers are experimenting with bold colours, materials like lace and leather, and even add sequins, embroidery and daring slits to jazz up the often-uniform black robe. Reem and Hind Beljafla began their abaya-design business, DAS Collection, 18 months ago after realising the market for high-end design for Muslim women in Dubai was woefully underserved. Their abayas are very much haute-couture - everything is custom-made and prices start at $1,000 (£606). 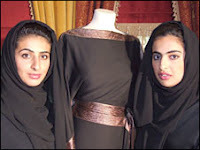 The young sisters say that as long as a woman's form is still covered by the abaya, there is no harm in having a bit of fun with the design. Hi Jana!u seem to be hijab-specialist;-) anyway i look for small help,do u know,or anybody know where(i doubt its able here)i can find a nice quality abayas or hijab wear in sharm el sheikh area;-))?ok i know this place is not the best to search for that,but we go holiday here hah i'd appreciate also good suggestions about shops in Cairo,ill be there for short time so i wish to visit just this right shops! Hmm, I'm not sure if this is the appropriate spot to put this Jana, but did you know that France is rethinking allowing the burka (perhaps the abaya) to be worn in public areas in France? What do you think of this new stance of the French government on Muslim clothing?